We left you last with our Port Washington stay for the stays. We re-stayed our whiskers and are ready to de-stayed the Port, and vowed not to be staid. So we motored to Oyster Bay, the former home of Mistress and promptly ruined the almost new Suzuki outboard motor while taking a dinghy tour about the harbor…shattered the pinion gear in the lower unit when we hit a submerged “wall”. But enough about our troubles…how are you? Any cruise, any sail, any boat is going to have its share of toil and troubles and tiresome moments. We can recount and rehash those stories endlessly, which leads to a one-upmanship of horrors. (Did I tell you of the time we had 3 feet of water in the bilge—or the time the lower forestay came apart—or….) The most memorable part of any voyage though comes from the encounters with others. These past weeks have been shared with a variety of interesting and merry few folk. A way not to be stayed, or staid, is to tango…easy movements that go with the flow. And who better to have with whom to tango than our friend Rebecca, one of the country’s foremost tango teachers. She and her gem of a daughter Jemmy joined us for a day as part of the flow. The train trip, and dinghy ride to Mistress reunited Traveler with his young girlfriend. New sounds and movements onboard may have kept them awake (darn those slapping halyards on the foremast), but nonetheless they enjoyed. Finally moving on, a short wind less motor from Port Washington to the former home of Mistress, Oyster Bay. As mentioned, a rough running outboard motor is not acceptable. And the report from the shop was even less so. The cost was almost the same as a new motor…an easy decision. But I vowed not to bore you with troubles…but this prelude is only to make reference to two fine folks, Melanie and David. Walking in town with the boys, we pass a dog hotel right near the marina. Halleluiah! Melanie runs Two by Four, a canine playground. As we made use of her service—and the boys did love it—we came to find that her husband had history with the sister ship of Mistress, the Schooner Nina. They come out for cocktails one evening, and learning of our dilemma, graciously offered the use of their jeep so that I could run to West Marine back in Port Washington to obtain a replacement outboard. And they pointed out that the mansion across the bay from which the helicopter would alight belonged to none other than the Piano Man himself. Who knew—and just around the corner from Gatsby’s place too. As the adage goes, they were indeed new friends when we were in need. All back together and ready for new partners, Mistress was graced by another famous tango teacher, Michelle Lamb and her boyfriend Eric. A slow sail, with some Nanni help, brought us around to Northport, in Huntington Bay. Unfortunately Eric had to work the following day and so we hopped in the dinghy to head to town…until his phone rang with the welcome information of another day off. Back to the boat! Northport itself was well worth the stop…and the pups especially liked the private island in the harbor on which they could run and swim and wrestle with abandon. No sooner did Michelle and Eric depart than my nephew Connor arrives on his first trip away from home by himself. I promised my brother Chris I would not harm him…irreparably. But work him we did. When free labor shows…! Wind and weather conspired against us, and so we had to remain in Huntington Bay for a couple more days…but Connor took to his role as dinghy boy, and the pups enjoyed the extra attention. Finally we’re off, but only around to Port Jefferson, still on the north shore of Long Island. And then a sail to Old Lyme, Connecticut. Why Old Lyme, from whence lyme disease acquires its moniker? (I don’t know that to be true, but who fact checks these days…so old school.) But in Old Lyme lives the inimitable Jay Bolton, former Master of Mistress back in the late 60’s when he and she were at the New York Maritime College at Fort Skyler. Jay dialed me into a mooring at the Old Lyme marina, run by the most unstrung Glen Abrahamsson. Also rising to meet a need, Jay chauffeured me on a parts run, and insisted on driving young Connor to the airport in New London for his flight back to Colorado. Yet another friend indeed. He and his bride joined us for a dinner onboard—though the interior is nothing like the memories he would have, the joy he expressed of being back onboard was palpable. Giving the pups their last tick check (and yes, ticks are indeed plentiful in Old Lyme), we were off…to Fisher’s Island; lovely quiet place, if you’re into lovely quiet places. Seems half the island is even quieter yet, being gated off from the hoi polloi, of which there were none other the stray wayfaring stranger. Thence to Stonington (that’s the way they speak in them thar parts: you know, as in From Whence and hie Thence shall thou spend a Pence, and revel in the Dense glory days of non-Sense)…and then to the other Sailing Capital of the US, Newport. Round the harbor, to the fuel dock we tie. And yet again, we come to meet yet another member of the Mistress family—young Kayla from Key West who worked on Mistress for a short time and now graces the deck of Adirondack II as Captain. The schooner world is a small one. To drop anchor amidst the storied yachts of Newport remains a thrill and honor. The Twelves launch daily reminding those who care to recall that the Cup was once ours, and once a sailor’s game. We bide our time, enjoy the sites and sounds, run the pups, and eagerly await our new crew. Don and Lynn Fegley and son Zach arrive from Maryland for a week. Tour through the Vineyard we did, as tourists are wont to do…then up anchor to Nantucket on a sleigh ride—a quick reach all the way. On the way there, exiting Nantucket returning to the Vineyard was the New York Yacht Club cruisers on their annual summer regatta. Who do we pass close aboard by our old friends Ticonderoga and Bolero. (We were told in Newport by the curator of the Trumpy exhibit at IYRS of the nature of the offshore islands. Block was for the hoi polloi, in the Vineyard would be found the elitist Democrat, while the Republicans hung among their own on Nantucket. Who’s to say where stereotypes and generalizations come from…but from some kernel of truth. But this summer was, to the greatest extent possible, politics free….good luck with that these days!) One night in Nantucket followed by an even quicker ride back to Vineyard Haven, with farewells to the Fegleys soon thereafter. Crew can be a blessing indeed…help on deck and help in the galley. Mistress is workable by schooner girl and I, but still…a hand now and then is, as is said, handy—and none are handier than Don and Co.
Time to move on…riding the tide through Wood’s Hole, up a short stretch of Buzzard’s Bay, through the Cape Cod Canal (aided by a 5 knot push), and up sail to Provincetown. Prior to anchoring we chase down and pass close aboard Istar, the schooner built, sailed, and mastered by Julie’s cousins, the Mayos—a founding family of P-town. Thence to anchor, equidistant between the town dock and Bloodhound—the secondary project of the extraordinary Josh Rowan of Key West…with Hindu, the owner of two classic wooden boats, thus a man with a serious fetish. We happen up P-town Carnival Week (as I did 18 years ago) which is much like Fantasy Fest in Key West, without any straight contingent. But we enjoy the town for a couple days—great lobster dinner with cousins Stormy, Josiah, Nathanial Mayo and family—walking the Dunes, setting anchor not once, not twice, but thrice (third time pays for all), running the boys on Long Point. Standard stuff…someday I’ll learn. But enough, the days are getting shorter, and so am I. A motor sail up to Rockport Mass, to see for ourselves the Motif—the most famous fish shack in the country. We are now in lobster pot territory, and vigilance is paramount. It is I who will have to dive and cut…. We are here for a night, for we must be off to Newburyport up the Merrimac River to see my Academy roommate, friend, confidant, and muse Frank Pierce—the man who gave me my name, Monk. The Merrimac, we’re told, is not for the faint of heart—but the gods were kind and we arrive on a slack tide. We meet that night as if 40 years had not elapsed—but that’s how it often is, and should be. Unfortunately he had to leave town early the following day, so we were not able to show him the comforts of Mistress, but there will be another day. We remain a couple days in Newburyport, a most friendly and quaint town, and return to Rockport to fully appreciate its charms. But then we’re off to Portland—a long trek up the coast. It’s a dawn launch, and a fine sail, but motor aided as we want to ensure arrival prior to dusk. We skip Portland proper, and pick up a mooring in Falmouth just north—where is so happens is the home town of a childhood friend from 4th grade, Kim Block. She is now a local TV anchor, and thus a local celebrity. On the launch ride in from the mooring, the launch driver Nathan happens to have spent time in Annapolis, worked at the Eastport Yacht Club (where we are pledged), crewed on Woodwind, and offers his car for our use. Did I mention the schooner world is small…. Kim arrives the next day to serve as host for a tour through Portland. I had not seen her since Julie and I were married, and it was a treat to visit on her home turf. Amazing how much Portland ME reminds me of Portland OR…similar shops, similar clime, similar pale people with purple pomps and pigtails. We’re offered a car (again), accepted, and a-provisioning we go. Not too far to the next mooring, at the Dolphin Marina in Potts Harbor. There, we meet no one we know! We do however dinghy down to Adm. Robert Perry’s private home and island. You’d think he’d prefer a home in Florida after so much time on the ice…so many do these days. But our “non-knowance” of folks is about to end. We roll into Booth Bay, where we are told Allan Miller and his bride Pam resides…the former owner of Pepe’s (in Key West). They come out to the anchorage in their lobster boat with an invitation to lunch. 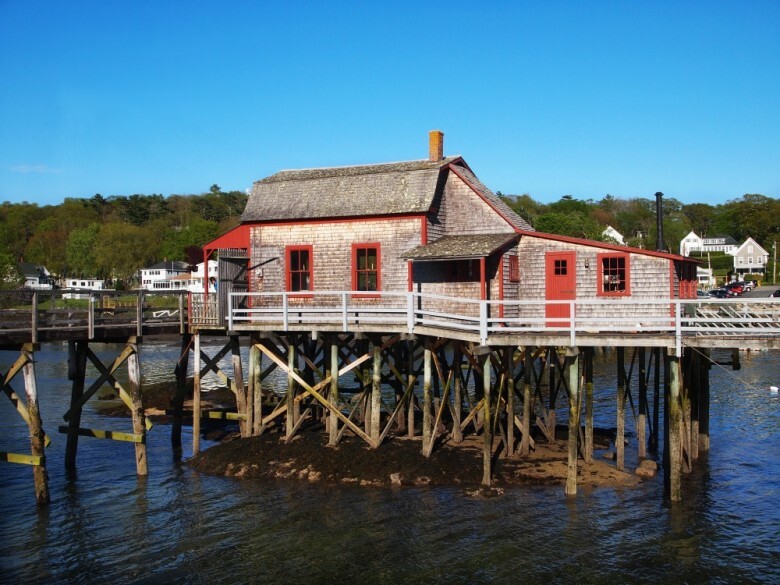 And what do you know, the iconic Bridge House of Boothbay is theirs—but not as full time abode (a bit on the chilly side in the winter). Always a delight to meet friends from one locale in a completely different venue. We even managed to go for a very short sail on their lovely little sloop…a 5 minute set up and tuck in. Even in a breath of air, we moved…somewhat totally unlike Mistress. It’s getting cold…for a tropical, if not topical, boy. Time to head south. And time to race home ahead of the topical tropical storms. (Please enjoy the audio links–if you want more pictures, which are worth many times these thousand words, please visit the facebook page on which bride Julie is doing such a marvelous job; ).